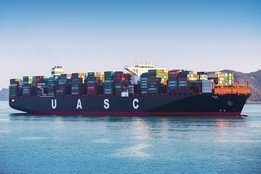 Hapag-Lloyd says it has signed a contract to retrofit its 15,000 TEU vessel Sajir to burn LNG bunkers. The conversion will be carried out in the Shanghai-based shipyard Huarun Dadong Dockyard Co., Ltd.
"The plan will be to operate the vessel using LNG, but to also be able to use low-sulphur fuel oil (LSFO) as a backup," the box carrier explained. The move, first announced last year, is part of a wider pilot project to help inform on its IMO 2020 compliance strategy. "By converting the Sajir, we will be the first shipping company in the world to retrofit a container ship of this size to LNG propulsion", says Richard von Berlepsch, Managing Director Fleet Management at Hapag-Lloyd. "By carrying out this unprecedented pilot, we hope to learn for the future and to pave the way for large ships to be retrofitted to use this alternative fuel." Sajir is one of 17 "LNG Ready" vessels Hapag-Lloyd inherited as part of its 2017 merger with UASC. The IMO 2020 pilot project will also see scrubbers tested on 10 of ships, while the rest of its 224 vessel fleet will be burning compliant fuel.